Protest at Cedar Rapids skate park. A roller skating rink in Cedar Rapids was the target of a weekend protest after two transgender teens say they were kicked out of the business. The transgender boys, who asked to remain anonymous, said they were asked to leave Super Skate during a recent “boys only” skate session. A parent of one of the boys spoke with KCRG-TV9 and summed-up their feelings in three words. “Upset. Hurt. Shocked.” Protesters gathered in the rain outside the business, located on Cedar Rapids’ northeast side, Saturday evening. “We’re sending the message that hate is not okay and that we want a safe space for our kids to be able to go,” one organizer told KCRG. “I don’t even know how to describe it,” said one of the parents. 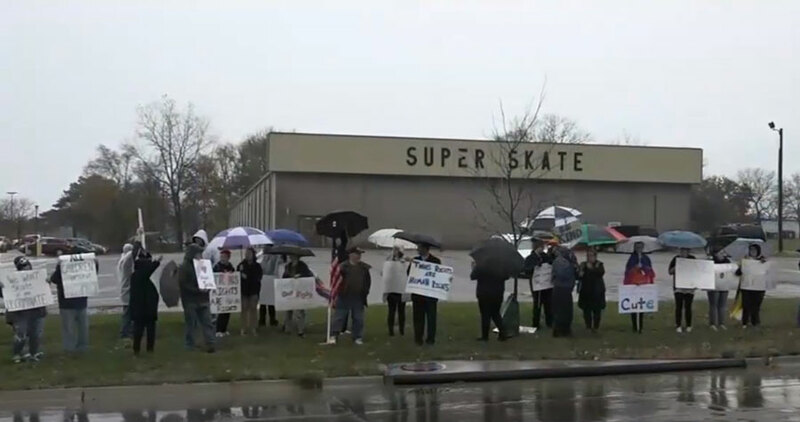 “I cried when I rolled into the parking lot.” One of the transgender boys said he’d been going to Super Skate his whole life and, until now, “never had a problem.” Organizers of the protest told KCRG-TV9 their goal Is for the LGBTQ community to receive equal treatment, but they also want an apology from the owners of Super Skate. KCRG-TV9 reported they made multiple attempts to speak with ownership from Super Skate both in person and over the phone, but a staff member declined to comment.